as shown here. Running bib2gls -g document did not seem to make a difference. How can the groups be kept separate and sorting local to them, without mixing of groups? 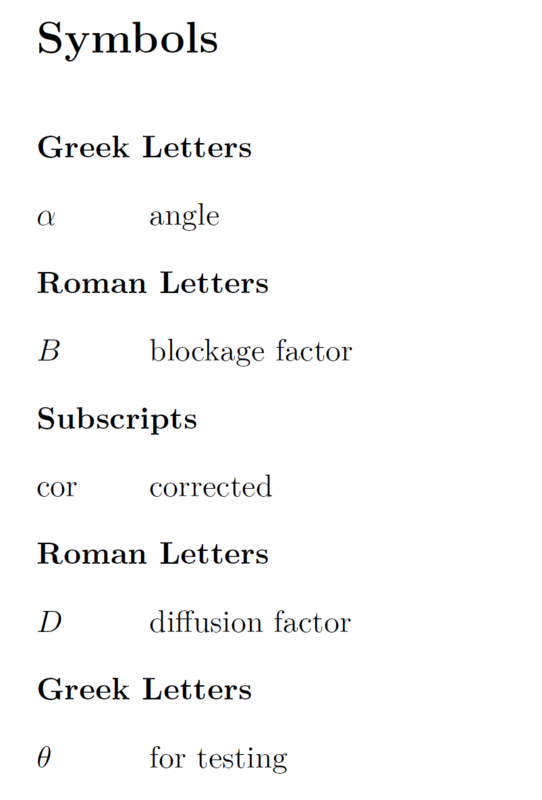 A possible workaround I thought of would be to have different types for Roman, Greek etc. and then call them all manually (as opposed to one type for symbols). But that seems not the right way. I feel like I am very close to the solution, but the last steps I could not find help with in the doc. After this answer, the core question was solved. The solution was found in the bib2gls documentation (and not glossaries-user, glossaries-code or glossaries-extra package docs!). While working, I found there is not a lot of novice-friendly material out there yet (aside from the excellent websites at Dickimaw). With that I mean hands-on examples that give a working baseline, and not just snippets. Therefore, I am uploading my current code for reference. It has a handful of concepts in it that might be helpful. It will have numerous issues still, but hopefully it serves people as a starting point to see what is possible, what the syntax is like, what commands there are, etc. % Record for bib2gls to work. 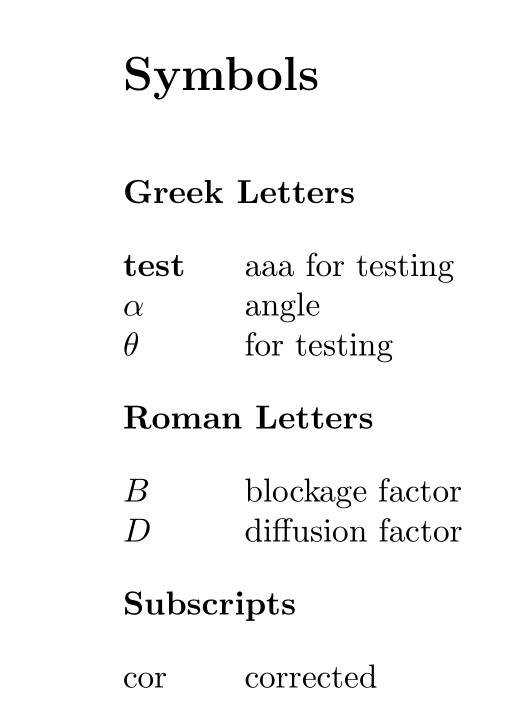 % Using Abbreviations/Symbols package options creates these glossaries already. % Create the rest manually. % Select all files in bib. % Not a good approach, but bib2gls seems to have problems with 'subimport'. % indexonlyfirst can also be a package option. % Index only on first use for certain categories, as set manually above. % Each bib-entry has a group-field. % bib2gls is smart and would take grouptitles from there, but those are just variables. % Give proper names for all groups here. % Remove from ToC (doing this manually). I won't claim that the docu is very clear here. But it seems to work if you set the sort-field to group and perhaps a second field as sort-suffix. The bib2gls-call was bib2gls --group file (the --group option isn't really needed in this example, but if you have entries without group field, it will create a title for them). Not the answer you're looking for? Browse other questions tagged sorting grouping glossaries-extra bib2gls or ask your own question. 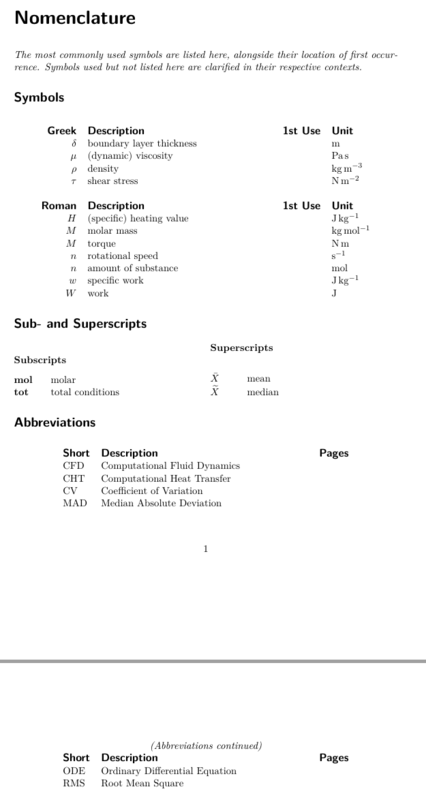 glossaries: How to customize list of symbols with additional column for units?